RANDOM: MORTUARY ANCESTOR "Doctrine Of Hatred"
I do remember listening to their "The Reincarnation" a couple of years back, songs that shows potentials but badly affected by the unsatisfactory productions. But here they are again with "Doctrine Of Hatred", this time I do honestly expect more of course. With years and experiences behind them, it should be something worth mentioning. And "Doctrine Of Hatred" might be just that. 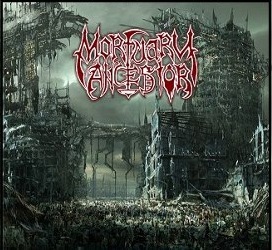 MORTUARY ANCESTOR of 2012 is a band that still is death Metal, but grows with their mastering of the instruments. The 5 songs here are shamelessly technical in nature, they obviously are challenging themselves with far more adventurous structures and layers in shaping the death Metal they are striving for. As the capabilities expanded, so is their compositions. "Doctrine Of Hatred" is a showcase of those culminating years within the band, very proudly and will always be death Metal, yet markedly and consciously evolves in tandem with the band's aging process. It might be hard to remember certain parts of them (the songs) in your head, but compensate that by following the stellar intricacies of the structures, tip-toeing if you must, and every now and then you will discover something within. The productions are deservingly good this time too. A solid Borneo death Metal offering, but you shouldn't acquire less considering the band's existence all this time. Time for another full length is nigh.